One of the things that jumps out at me fist about this CD is how much the band have changed the way they put songs together. Their recent 10" record on Fudgeworthy Records had over fifty tunes on it. This CD runs for about the same length of time and has a relatively anemic15 tunes on it. The main difference seems to be the noise factor. 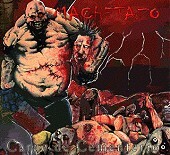 MACHETAZO used to flesh out what they were doing with a healthy dose of pure noisecore mayhem. On "Carne De Cementerio" they have tightened things up quite a bit and put their emphasis on developing a more "pure" mincecore/gorecore sound. In many ways they remind me of MORTICIAN but that may be due as much to the horror movies samples that lace the CD as anything else... although they are certainly of the "how low can you go" school of thought much of the time albeit with less of a death metal vibe and more of a grinding one. Fans of gore and mince will be all over this. More discriminating grind fans may want to try and hear some of the CD before picking it up. Folks with a weak stomach ought to forgo it entirely. I'm sure the band would want it that way. Macha: See It Another Way Machetazo: Realment-Disfruto Comendo Cadaveres 10"